The Energy Don's Blog: In praise of Paris's Vélib! In praise of Paris's Vélib! It's all too easy for a blog to sink into negativity, carping at all the things that are wrong, misleading or inexplicable. So, this for entry I'll focus on something good…well, not 100% perfect, but perhaps something from which we could learn. 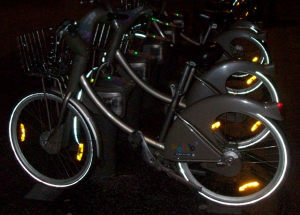 Cycle hire schemes are all the range in capital cities. 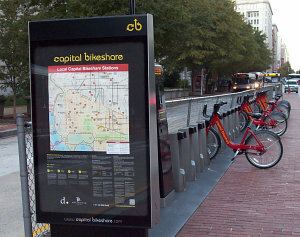 Berlin is installing one, London has its Boris bikes and even Washington DC has a scheme (above). But the granddaddy (or should that be grandpère?) of the all is Paris's Vélib, launched in 2007 and with 1,200 docking stations and some 16,000 cycles, the second highest number in the world (after Hangzhou, apparently). That's around 3 times as many bikes and docking stations as in London, and 15 times the number of bikes in Washington. And last weekend I was lucky enough to be in Paris on a dry day, with a number of destinations to visit, so able to test it for myself. Firstly, it's user friendly. Arriving at the Vélib station nearest to my budget hotel (which was just outside the famed Boulevard Peripherique orbital motorway) it happily gave me instructions in English and accepted my non-French credit card to give me a 24-hour code, asking me to add my own 4 digit PIN. And the daily hire charge was exactly the same as single ticket on the Metro or for a bus. Once done, it was simply a question of choosing a nearby bike and working out the correct angle to pull it to remove it from the locking device. (OK, I'll admit it, I was 90° out the first time and had to re-key in my details to get a second chance.) Thereafter it was plain sailing (no, plain cycling). Vélib bikes are rather like Boris bikes: heavy and unlikely to be attract cycle thieves, but quite practicable for a reasonably flat city like Paris. They have a 3-speed gear change which I found a bit too ready to change: I only had to wiggle my wrist to find myself unexpectedly in the wrong gear. And, like many hire bikes, for a regular cyclist the top gear was almost the only one necessary. Why this paean of praise to Paris? Because the Vélib seems to work better than the London bikes (or those in some other cities that seem to discourage non-native users). The key feature is the density of docking sites – they are typically no more than 300m apart, and most have large numbers of stands. This means that there is nearly always space to return a bike near to your destination (a real problem in London) and in most cases there are bikes available. Of course Saturday may not be a typical day for the system, and returning late at night to Porte d'Orleans Metro station I found the rack empty – but no problem, as the one round the corner still had seven available cycles. And earlier on I had taken the past available bike at the Parc des Expositions. Conversely, I did also find two full racks (both near the Bastille) but only at locations where I was tempted to swap over my bike to avoid the 50c penalty charge for exceeding 30 minutes' use. It's not perfect: one bike I took out of the rack without a proper inspection proved to have only one pedal (and so had to be swapped over hurriedly.) I am not sure if on a weekday the distribution of bikes may have been more of an issue, although Paris's layout may help, with few skyscrapers inside the Boulevard Peripherique meaning workplaces are more evenly dispersed across the city than in London, and the high density of Metro lines permitting more Vélib stations to be located at termini. Then, of course there are French drivers. Even when they can see a Vélib bike on the bike lane (and yes, I was wearing my hy-viz jacket) the concept of indicating if they are planning to turn right in front of the cyclist still seems a bit foreign to them. French drivers are also prone to double parking with their hazard warning lights on, and seem to enjoy pulling off without indicating precisely as a cyclist overtakes them. And there seemed to be a significant minority of drivers (largely, but not exclusively taxis and vans) who regard cycle lanes as convenient short-term parking. In fact some of the cycle lanes seem to have been planned by sadists (well the Marquis de Sade was French), such as one dropping cyclists off on the wrong side of the road (well, the English side) at the entrance to the Place de la Bastille, requiring them to enter in the middle of the roundabout over what were really quite uneven cobblestones. So I suppose I could summarise by saying that the cycle scheme is great value and well organised (each time I rented a new bike it remembered to tell me what to do in English), but that French drivers need to be more aware of the cycles in their midst. I am a reasonably experienced and confident cyclist, but it needed a degree of faith to keep pedalling on in some situations. But if there's one lesson that we could learn it must be that a successful scheme needs a lot of bikes and a dense network of docking stations to be of use. For despite my reservations, I still hope to use the Vélib next time I'm in Paris.